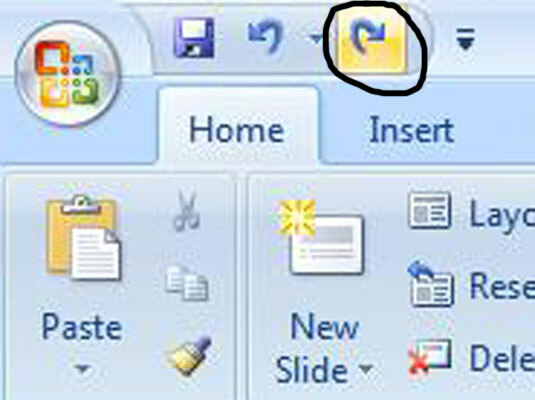 If you make a mistake while editing your PowerPoint slides, use the Undo command. The PowerPoint Undo command is your safety net. PowerPoint Undo remembers up to 20 of your most recent actions. You can undo each action one at a time by repeatedly using the Undo command. Or you can click the down arrow next to the Undo button on the Quick Access Toolbar and then choose the actions you want to undo from the list that appears. 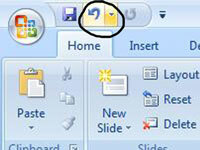 1Click the Undo button in the Quick Access toolbar. 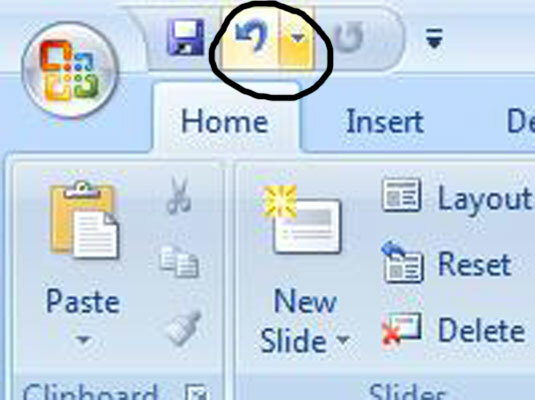 The Quick Access toolbar is at the very top of the PowerPoint window, next to the Office button. Undo reverses whatever you did last. If you deleted text, Undo adds it back If you moved an object, Undo puts it back where it was. 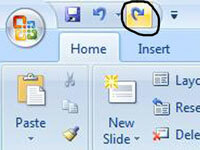 3Click the Redo button on the Quick Access toolbar. This puts back the last thing you deleted, if you did so accidentally. Note that if the last action you performed wasn’t an Undo command, the Redo button is replaced by a Repeat button. You can click the Repeat button to repeat the last command.